A pivoting guitar wall hanger that won't wear out. After 20 plus years as a core guitar accessory, String Swing's model CC01 is getting a makeover. The renewed Home and Studio Guitar Keeper has a deep cradle design that prevents the guitar from being improperly placed in its hanger, which promotes safer handling of your instrument. This guitar wall hanger design is also great for guitars that have a headstock with single or uneven heels. The yoke pivots to cradle the headstock, but is free of mechanical, moving parts that would wear over time so this product is manufacturer-guaranteed for life. Wood block is made of real hardwood. Natural wood color may vary. 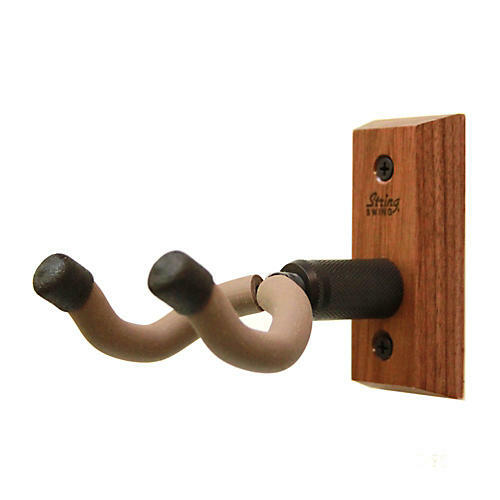 This sturdy wall hanger holds your guitar in safety. Order today!